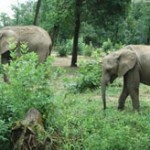 About 35 km from Bhawanipatna, the district headquarters of Kalahandi, on Bhawanipatna-Thuamula-Rampur road is Karlapat, famous for charming wildlife. Tigers, sambars, leopards, gaur and chitals have rich present in these forest tracts. Other region such as Debrigarh and Sunabeda are rich in wildlife too. This entry was posted in Karlapat, Orissa. Bookmark the permalink.